Earlier this year I received a disquieting text: 21 Jump Street was being made into a film. A film starring Channing ‘She’s The Man’ Tatum and Jonah ‘Superbad‘ Hill, the latter of whom had helped write the script. My disbelief turned to horror. My horror turned to silence. My silence turned to red, simmering rage. So, it came as a huge shock to me that as it turns out, I actually really liked the film. If you haven’t seen either the tv series or the film, the basic premise is that youthful looking police officers are sent undercover into high schools for a whole host of different reasons. The original series was very, very ’80s. It had leather jackets, male eyeliner, Johnny Depp, and an appalling amount of taffeta in the prom episodes. 21 Jump Street mixed serious with silly, and quite often would try its hand at social and political commentary. In between jokes about bowling and ‘buddy’ banter, it managed to cover topics from the Vietnam war, racism, sexual assault, teenage drug use, homeless to AIDS. It floundered a lot towards the end, lost a lot of its original cast and charm, and probably ran two seasons too long. That aside though, it still holds a special place in my heart/DVD collection, so the idea of a remake made me dubious. 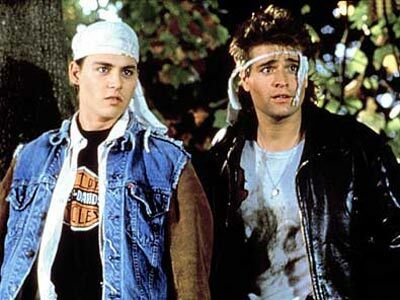 Johnny Depp and Peter DeLuise as the original McQuaid brothers. However, somehow, they pulled it off. I think the success of this lies in the fact that the film essentially is nothing like the tv show, other than having the same basic premise and title. It’s buddy film meets high-school comedy, with subtle nods to the original series. It also pokes fun at itself for being a remake. Jenko (Channing Tatum) and Schmidt (Jonah Hill) are high school polar opposites who find themselves re-united seven years later at the police academy. Classic buddy-cop film plot initiate: they have differing skills, partner up when they help each other overcome their weaknesses, and mess up their first arrest – leading them to be sent to the newly re-started ‘Jump Street Program’. Their task is to find out who is supplying a new type of drug at their old high school. It’s hard to explain what ensues without ruining the film, but it includes a decent amout of Peter Pan, jokes about hipsters, unexpected cameos, and the classic Jonah-Hill-movie party. I went into this film expecting to either hate it, or to at the very least leave highly irritated. So the fact that I forget this about two minutes into the first scene is either testament to my lack of conviction, poor attention span, or to the film’s clever and quick paced script. It’s weirdly hilarious, constantly entertaining, and something I would actually happily watch again. Well played Hill, well played. This entry was posted in Film, Reviews, Television and tagged 21 Jump Street, Channing Tatum, Johnny Depp, Jonah Hill. Bookmark the permalink.